The UASC-1, a new external self-powered USB sound system for digital and analog audio on Mac, PC or notebook computer. Combining ease of use with the power of technology, UASC-1 offers musicians, DJ's and producers a mobile monitoring studio solution that satisfies the requirements of both analog and digital audio applications. Wave Idea sells the UASC-1 directly for €209. 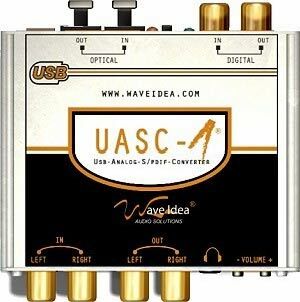 For more information, visit their web site at www.waveidea.com.